Baby hummingbirds on Tuesday morning (June 22nd) , 2 days old on the left and 3 days old on the right. To view other Wordless Wednesday posts, click here. how precious! they are so cute. aww, wonderful (and lucky) shot! wow, Karen, love all your shots, the transformation, the story, it is very interesting to witness birth of a wildlife, and you are so blessed to be part of it. Wow, I can't say that I have ever seen baby hummingbirds like this! The nest is so spherical. This is a great capture. 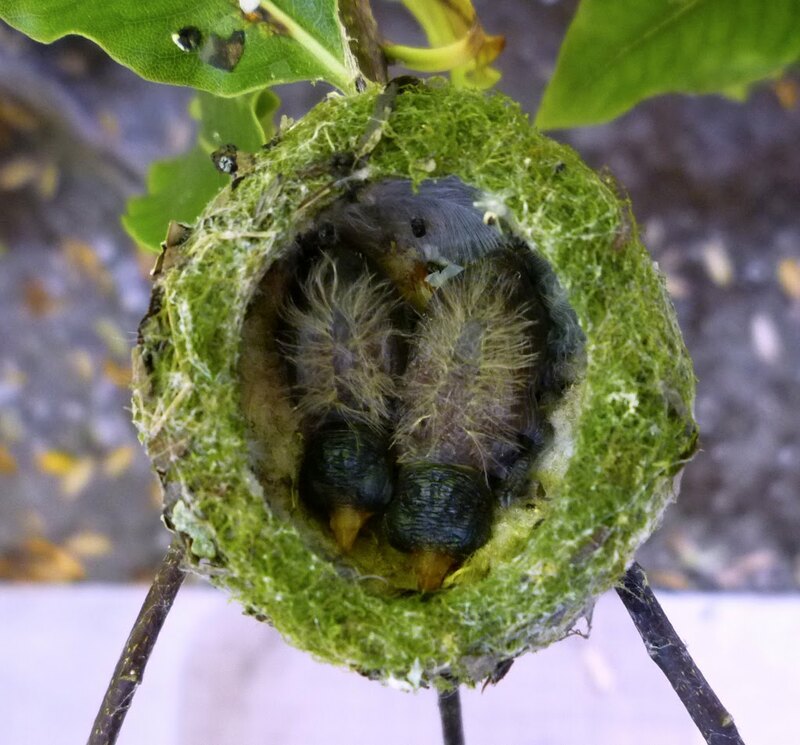 I've never seen baby hummingbirds before, let a lone baby hummingbirds in a nest! Great capture. They look sooo tiny! wow..young babies. have never seen before. Oh, my, the eggs are completely hatched! You got them captured beautifully and so sweet scene of those baby birds. Oh, silly me! I misunderstood at first and thought the baby born last was bigger as it had remained longer in the shell. They look so fuzzy and cute. Strange to imagine how unbelievably agile and beautiful they will be soon. *squeeeeeeeeeaaallll* how cute is THAT?! fantastic shot, fantastic composition. Thanks! Amazing! You are so very blessed to find let alone document this beautiful transition! I have never even found an empty nest! I have several that come to my window feeder & are so fun to watch. so enjoying the journey so far! Amazing, Karen! Thanks for taking these amazing shots. When hummingbirds are close, they sound like very large insects. Thanks for everyone's comments. I hope to post more updated photos on Sunday. It'll be the one week mark when both eggs were hatched. What a PRECIOUS shot! They're so ugly, they're adorable!